This article will provide you with information about rock gardening. Rock gardens are not just gardens full of rocks. A traditional man-made rock garden can contain a ton (literally) or more of rocks, but they are placed artfully among the rock garden plants that will surround them. In nature, rock garden plants occur in pockets between the stones where soil has blown in or scree has been created by the action, over eons, of wind and water. The plants that survive in those conditions have evolved over time to require excellent drainage. Many rock garden plants would do poorly in the average garden border where they might receive too much water, but they thrive in the most dry areas of the landscape where other plants won't grow. Sound interesting? 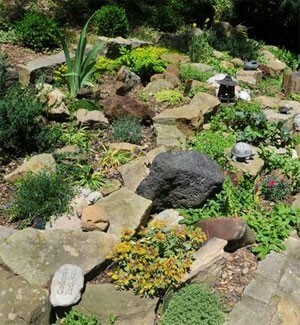 With a little planning you can create a rock garden of your own wherever you live. Your rock garden will be most successful when you mix rock garden perennials, small garden shrubs and trees, and dwarf varieties of other plants that can be adapted to rock garden culture in the area. If you are not working with a landscape designer who can assist you in plant selection for your rock garden, it might be a good idea to spend a little time doing some research to find and select plants that you will want to include. Make a list of the plants you might like to incorporate in your shade garden, jotting down notes as to size, color of foliage, size and texture of foliage, and so on. Rock gardens can be located in sunny or shady areas so long as the soil is consistently dry, and well-drained. Rock gardens are really beautiful so try to position one where you can see and appreciate it from a window inside your home or near outdoor living areas where you will spend time outdoors. If you can see it every day, you will appreciate it all the more. Hillsides and slopes are perfect for building a rock garden on. Rock gardens can be made on flatter ground, but even slight elevations in parts of your garden will make it look more natural and provide the drainage that most rock garden plants prefer. If your rock garden will be small, you and your family can probably handle the earth and rock moving chores yourselves. However, if you intend to place large boulders in the garden or on a hillside, it might be best to hire professionals who have the equipment necessary to lift large boulders. The rocks placed in your garden should look as natural as possible. That may sound like a no-brainer, but there are several things to consider. If possible, use some rocks and boulders found on your own property. If there are none, or not enough, visit a local stone yard to choose rocks that will blend with the environment and with rocks that may already be there. Each rock has several surfaces; usually all of the back and bottom surfaces and much or all of the top and sides will be buried in the garden soil. Therefore, choose stones that have interesting "faces" and bear in mind that the "grain" of each stone's face should run in the same direction. Size of rocks is also a factor. The stone outcroppings in an actual hillside will be of many different sizes and shapes, and that is what you want to duplicate. Place a few smaller growing specimen trees in the garden if space allows. Japanese Maples, Hollywood Juniper, Japanese Black Pine, and Hinoki Cypress are a few nice selections for a rock garden. Bear in mind that even in natures rock gardens, where most of the plants are quite tiny, there is variation in the overall size and shape of the plants as well as in the size, shape and color of the leaves and flowers. Just make sure that the plants you choose are drought tolerant - requiring little, if any attention to watering. Your welcome John. I've plotted a rock garden in my front yard, out by the road where there's no irrigation and it's too far to drag a hose. Have added a few plants but need to add some boulders and rocks. Once that happens, I'll create a virtual garden here in Gardenality to upload pics to and to list all the varieties of plants in the garden. Another suggestion for rocks of "perfect" size....hypertufa! The recipe can be modified for many different uses and qualities; adding a bit of color during the mixing process gives interesting results too.